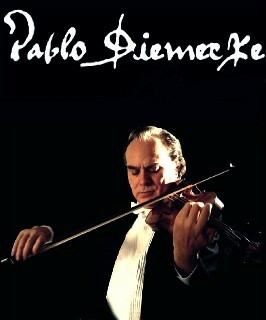 Pablo Diemecke, Grammy Award Nominee in 2002. Concert Violinist, Music Director of the Orchestra Des Concerts Diemecke, and the Royal Oak String Ensemble. His solo engagements have taken him throughout Nor America and Europe. His recordings include concertos by Prokofiev, Mozart Concertos #2, 3 and 4, Dvorak, Carlos Chavez. and his latest Cd, “Musica Latina, Selecta”. Mr. Diemecke is presently teaching violin, viola and cello. He also offers musical and technical coaching for other instruments. Pablo Diemecke, Grammy Award Nominee in 2002. Concert Violinist, Music Director of the Orchestra Des Concerts Diemecke, and the Royal Oak String Ensemble. His solo engagements have taken him throughout North America and Europe. His recordings include concertos by Prokofiev, Mozart Concertos #2, 3 and 4th, Dvorak, Carlos Chavez. and his latest Cd, “Musica Latina, Selecta”. Golden Lyre Award of Mexico.